The spaces in-between. Not where you started from or where you are headed, but where you are. For that moment. Glimpses of passing spaces etched in your mind. These images are cross-posted on the collaborative blog Journey of a Photograph. Please visit to learn more about the inspiration behind their creation. Very stirring, Karen…and thought-provoking with your words. Hi Hanno, thank you very much! Stunning! These are wonderful, Karen! Ah, Karen, I just love this journey…. Traveling by train is lovely. Thank you, Marina. I can imagine sitting on a train and seeing these things whirl by. Sitting on a train you have a choice – be in the moment and see the present and past at once or do something else. I found that I wanted to look out with you, Karen. Lovely photos. I’m usually glued to the window, if it’s possible. : ) Thanks for your words, Judy. Thank you Karen for sharing! Another set of fine photos! I try to exorcise these moments of driving from one place to another by taking photos. Traveling gives lots of opportunities, doesn’t it? Thanks for your comment, Vassilis! Transitions! The places where anything is possible! Love these, Karen! Fantastic images Karen. Such and incredible sense of movement. Your last photograph, my favourite, has me stumped as the movement seems to be going in different directions. I’m assuming it’s a composite of more than one image but how it’s so seemlessly woven together to give this feeling of coming and going all at the same time, such that you are in the space in between is amazing and quite magical. Superb! They are are just straight photographs, although, I have cropped some of them. 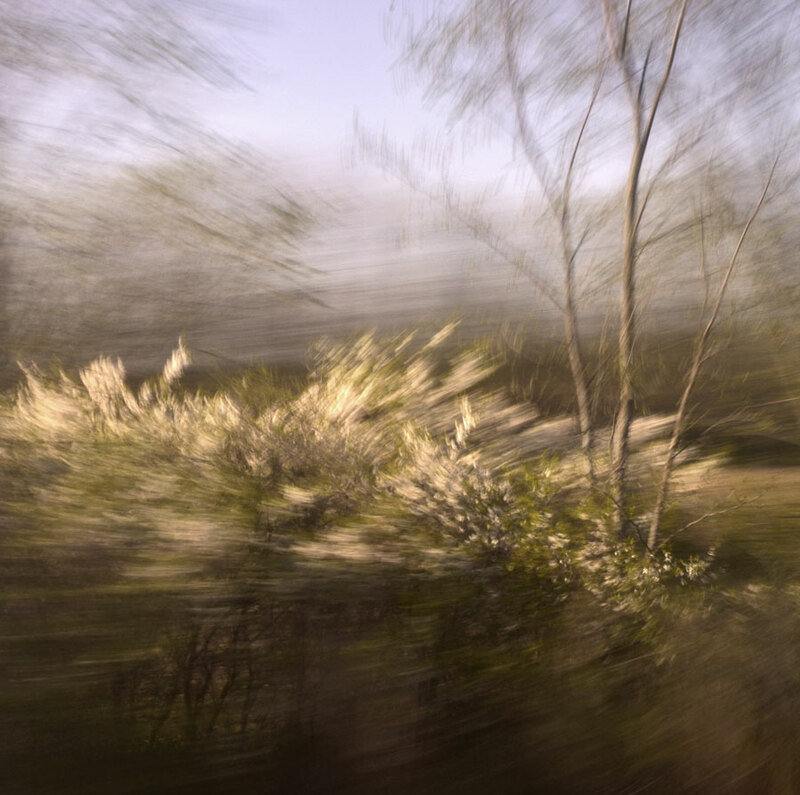 I was using a long(ish) exposure and panning the camera with the movement of the train. 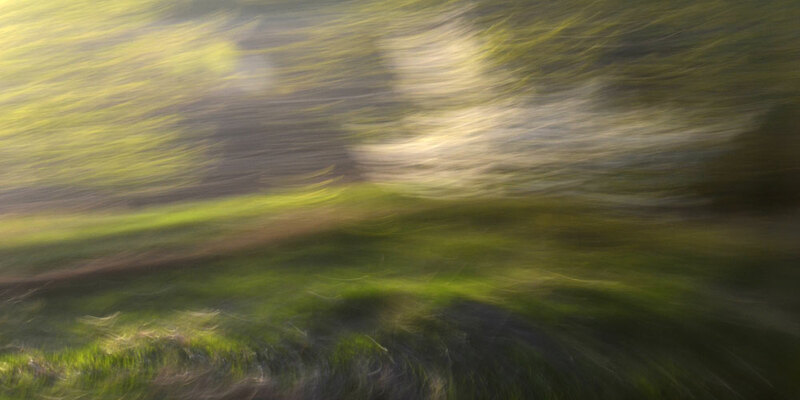 I’m not quite sure how that last one worked out that way – the magic of movement and long exposures, I guess. Endlessly fun! I’m glad you like them. beautiful images, they have some fantastical fairy tale qualities to them. Thanks very much, Tom. 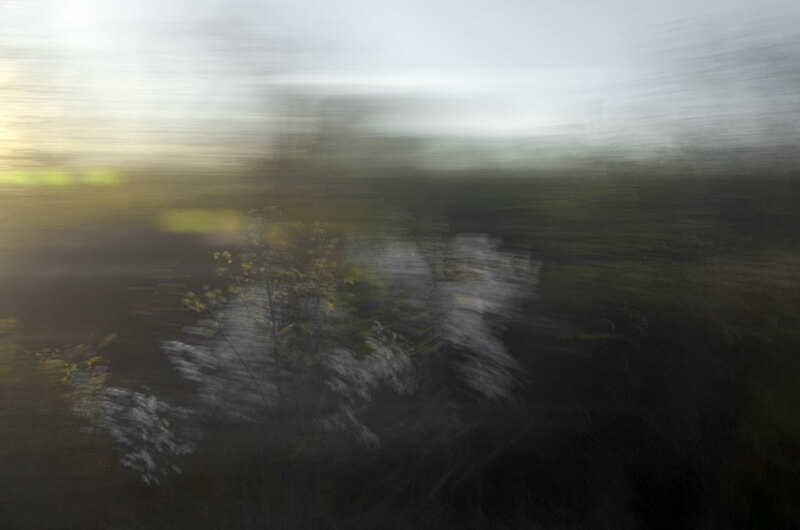 I was fortunate to have a series of small blossoming trees along the the railway line to play with. A fine collection – excellent images and quite inspirational. I can’t help wondering how many shots were trashed before you made tour final selection!! I like the result – a lot!! Hi Louis, thank you. Yes, I did take a good number of photographs to edit! It’s sort of experimental with settings and hard to know how things will work out in the end. I think that’s what makes this type of photography so much fun – it’s always a bit of a surprise! Who needs paint when you are able to paint with light alone. I am awed. Thanks very much, Elena. I guess it really is playing with light. If you are awed then I am thrilled. Elena has said it with an eloquence I can’t match – it does seem you are painting with light. Katrein, thank you, I’m glad you think so. These are really wonderfully, sploshily painterly. And full of tough action. They make me think of the work of Ian McKeever. They have a dream like quality… like impressionist landscapes…. haunting, mesmerising. Gorgeous! Thank you for your contribution to the journey, and for letting us be a part of yours! 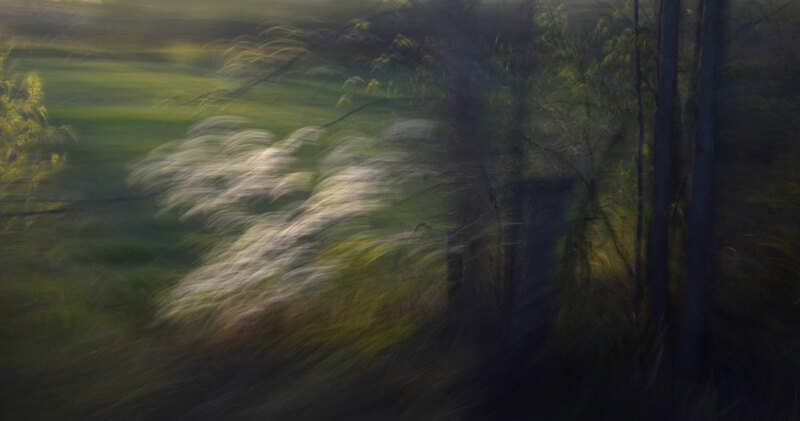 Hi Emily, when I saw your photograph it made me think of visual memories of in-between places and since I was traveling by train, it seemed to come together as a response so nicely. Thanks for starting this project, I’m looking forward to each leg of the journey! Journeys have been on my mind, and I am happy I visited here today. Your images and words have been expressed with such beauty and care. I could look at the second photograph forever. Hi Patricia, yes there is something so wonderful about going on any kind of journey. Thanks for your comment, I’m pleased you enjoyed this post. Superb images Karen, you definitely have a style all of your own. I agree with Chillbrook and love the last one. Very striking breathtaking image, especially the last photo. Hi Yoshizen, thank you! They were a lot of fun to make, and always a bit surprising. These are ‘out of this world.’ I get to one and would think that it was my favorite and then the next one would become my favorite and on and on. Really superb, and it goes to show, again, that one does not need the best lens or camera [although I am sure this one is a good one] to come up with fantastic images. I think you are right about the tools that one uses – you can be creative with anything and sometimes the “less expensive” tools provide very interesting possibilities. (These were taken with my Nikon D7000 and a good lens, though.) I truly appreciate your comment. Excellent work and creativity, again. A wonderful journey, Karen. Bente, it was a wonderful journey. And lots of fun to make this set of photographs. Thanks for your kind words. Fleeting moments of beauty. Fabulous, Karen. I am about to embark on a cross-country drive and these images remind me of looking out my window taking in small “snapshots” with my eyes as they go by. Will think of these! Enjoy your trip, Jane. I love road trips! dreamy… such a wonderful eye! Beautiful series, Karen. Lovely to see this journey and the blossoming trees. It is rather lovely weather here at the moment, I’m loving watching things grow and bloom. Thanks, Simon! These make me think of impressionist oil paintings. Really beautiful. The movement and colour of these photographs is impressive, wonderful takes, Karen! I also like a lot the idea of the “travelling photograph”. I have previously participated in other collaborative projects (through Flickr) and I find them both challenging and rewarding. For an example of a previous collaborative project you may see Where in the World is the Tea Tin Pinhole Camera?? Oh, I love the traveling pinhole camera project! Those are great images and a wonderful collaboration idea. These are so beautiful. The second one just knocks me out. It makes me think I’m remembering something I forgot maybe centuries ago. You always catch something in a movement or texture that sparks the imagination. I like your reaction, Steven. There is something about traveling that stirs up other memories I find. I’m glad you get the sense of this in the images. and a superb journey it is! Very nicely done Karen, terrific work! Much appreciated, Phil. Thank you. I find train rides incredibly inspirational. You really nailed the feeling of looking out the window not to see what’s outside, but to see what we have deep within. Amazing, Karen! It’s 8:53 a.m. and your photographs are a refreshing way to start the morning. That’s very kind, Millie. Thank you! I am constantly impressed and inspired by your work. Sincere thanks to you, Astra Wally. That’s very nice to hear! It is an interesting project, I’m glad you think so, Ephem. Karen, this is so amazing, I am in awe ! A almost spiritual journey. Those photographs are incredible beautiful, so full of energy, excitement and joy. Your blog is always such a great place to visit. Otto, thanks very much for that, I appreciate your very kind words. I like that quote, David. Thank you. Hypnotic, like the clck-clack of the tracks. Thank you, Mike. There is something hypnotic about a train, I think. very interesting and I agree.. hypnotic. I have never seen such photographs. These are the poetry which light and color weave.